When Quince is in season and cheap to buy peel and dice them and put them in a pan to simmer with little water according to quantity of quince to be used. 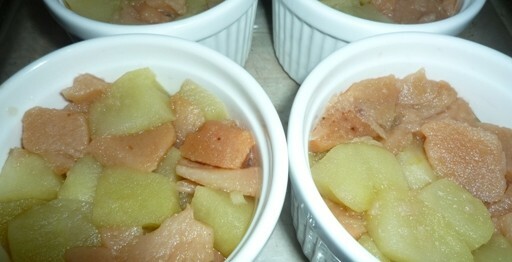 In this recipe add 2 tablespoons of water to 500g of quince, simmer it covered till it softens, roughly for ten minutes. Do the same to the apples but cook them in less time, or alternatively, add the apples to the quince at approx 8 to 10 minutes of cooking the quince then cook it all together for approximately 5 more minutes or when the fruit feels soft to touch. Take it off the cooker and let it cool slightly then stir in the 2 tablespoons of sugar and set aside. In the meantime mix the butter or margarine into the flour by adding a little piece/knob at a time, mixing it in with your finger tips to incorporate the butter into the flour until all the butter is finished. Your finger tips shouldn’t touch the bowl, instead mix only with your finger tips by lifting the flour and butter above the bowl and letting the crumbs fall into the bowl then pick them up and repeat until they resemble like fine breadcrumbs. When finished the mixture would look like either fine or large bread crumbs depending on your mixing touch. Light finger tip action will result in lighter smaller bread crumbs texture and heavy handling of flour and butter will result in uneven mixing. Roughly about 10 to 15 minutes for this process and after a few attempts you’ll get it right in no time. I made Stephen an expert at it so if he can do it you certainly can. Stir the sugar and oats though the mixture once complete. Stir in some lemon rind but its optional as desired. To assemble, divide the fruit mixture into 4 ramekin dishes then top up each dish with the crumble mix as densely or as thinly as you wish but I prefer at least 1/4 of the dish filled with the crumble mix. Place these filled dishes above the centre of your preheated electric oven on 190 degrees Celsius for 20 to 30 minutes. 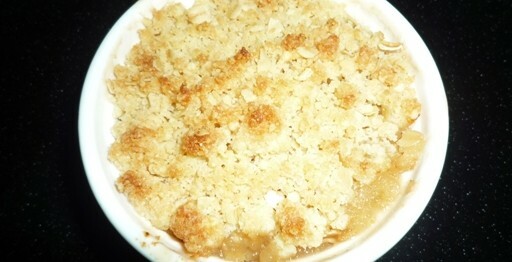 The dish is ready when the crumble has turned golden in colour. Serve hot with pouring custard and cream or with ice cream. Yum! The quince I used for this recipe was already gathered from my friend Helen’s garden, cooked and frozen for use later. 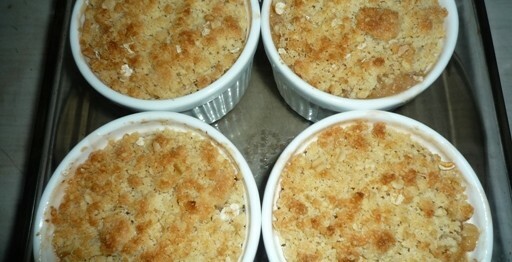 If preferred, some almond meal can be stirred through the crumb mixture too. If you don’t have or can’t get quince then use all apples or mix apples with any berry fruits. Rhubarb crumble is another favourite of Stephen’s for his sweet tooth he asks me to sprinkle more sugar on the crumble mix before baking and he says yes please to all custard, cream and the ice cream! Enjoy this recipe the way you like it.